My name is Melinda and I'm the face behind Here We Go Loopy Lou. I live in Melbourne with my husband and our three boys aged 7, 5 and 3. I am a social worker and I work part-time in health care. I have always loved stationery and I have always loved fabric, so four years ago, I combined my two passions (one might say addictions!!) to create my own line of fabric stationery. I just absolutely love doing what I do. Can you explain your craft/art and the material you like to use? I make fabric greeting cards. So the material I use is fabric, fabric and more fabric! I am always amazed at the wonderful designs, patterns and colours available and the endless possibilities fabric creates. A beautiful fabric transforms a simple greeting card into something so unique and worthy of being a keepsake. My customers often tell me that they only give my cards to people they know will treasure and keep them. I am a sentimental person by nature, so it makes me so happy and proud to think that my greeting cards are such treasured keepsakes. Where do you get your inspiration and what is your creative process? The fabric itself is my inspiration. I am absolutely meticulous in my fabric selection. A fabric must "speak to me" before I will use it in my range. I spend hours upon hours searching the Internet for the perfect fabrics. I just get "that" instant feeling when I find the perfect fabric. I still get excited every single time I order new fabrics and I have been known to stalk the postman!! Of course I look to seasonal colours and patterns for inspiration. However, my range is never completely "on trend". I like to think of it as eclectic! Of course there are times when fabric arrives and, as stunning as it is, I realise it is just not right for my cards. I hate to see beautiful fabric sitting in a cupboard, so I often donate these pieces to charity. My sons' school is heavily involved with a school in Zambia. The have a sewing circle, so a lot of my fabric is sent over there. I'm having fun working on my Christmas range right now. I'm playing around with various fabrics, colours, patterns and fonts. I do tend to spend a while thinking, drawing and placing my designs, but eventually I do settle on something!! How long have you been creating and how did you get into craft/art? Both my Nan and Grandma were crafty. My Nan was a seamstress during the war making uniforms for the soldiers. Between them, I had an array of handmade clothing and costumes during my childhood! I would often sit with them and learn to hand sew and knit. However, it wasn't until I had my first son that I found my passion for craft. While he slept, I needed something to keep my mind occupied. I started experimenting by making cards with some fabrics in my stash and my business has just grown steadily from there. Now that I've returned to social work, making cards has become even more important to me. My job is very emotionally challenging at times, so making cards is my creative outlet, my therapy if you like!! The business side also challenges me and stimulates my mind. I guess I am proud of what I have achieved during these last four years as I am self taught (with lots of wonderful advice and guidance along the way). How did you come up with your business name? My name is Melinda Louise. As a child, my parents called me Lindy Lou. In later years, my husband decided that Loopy Lou seemed more fitting!!! So for years, I have been called Loopy Lou by my family! Yes, a grown woman being called Loopy Lou!!! So, Here We Go Loopy Lou just felt right when I was deciding on my business name. It helps that I am a little loopy at times!!!! What resources 'have or do you' use to help your creative pursuits (i.e. groups, classes, shops, websites etc)? Where do I start?! I have made so many creative friends over the last four years. I have made many friends online, many of whom I've had the pleasure of meeting in person. I've also made many new friends at markets. These ladies inspire me, encourage me, support me and educate me. So, one of my greatest resources has been the friends I have made through the blogsphere, through forums, through Facebook, Twitter, Instagram and through markets. Running a business is a completely new venture for me and I soak up every piece of information I can. I follow businesses such as Create and Thrive, Designing an MBA and Studio Existo. I regularly take ecourses and purchase ebooks from such businesses. I have also attended seminars and events run by Craft Victoria and the Creative Women's Circle. My theory is that I am on the only person who can make my business successful. I need to be constantly learning and challenging myself in order to grow. I always think about what I am doing well and what I can improve on. In terms of my crafty pursuits, I have recently started knitting again. I love craftsy.com for all the creative courses they run. I've also been known to turn to YouTube to teach myself a new stitch or technique! It's crazy how much is on YouTube! What's your best advice for someone starting up? Perhaps one of my biggest pieces of advice is to be patient. Very few of us make our first million overnight!!! Four years ago, I knew I had a unique and lovely product and I wanted to sell it. I spent hours on the Internet researching things like setting up an online store, product photography, writing product descriptions, postage and packaging options, logo design and advertising collateral. 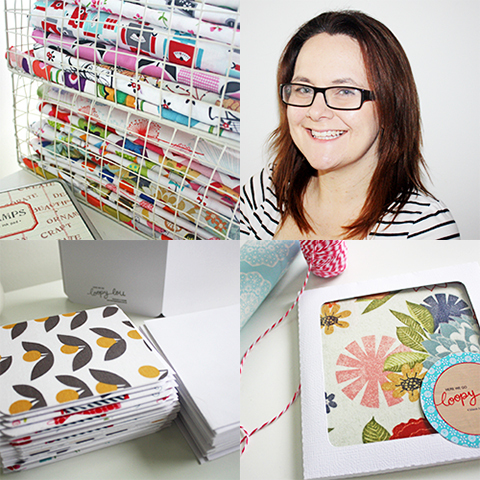 I eventually took the leap and listed my cards in my Made It store. However, I truly did not realise the effort it takes to be noticed. There were times when sales were slow (non existent even) and it felt like nobody was listening to my blog posts, Facebook posts etc. However, I was confident in my product and I was confident in myself. I knew I could make it work. So I was patient and I kept going. When I look how far Here We Go Loopy Lou has come in the last four years, it makes me so excited to think what lies ahead for me in the next four years! Another thing I cannot stress more is providing exceptional customer service. Of course you need to make beautiful, quality products but it does not stop there. Connect with your customers, provide them with an exceptional level of service that makes them remember you and want to come back for more. Communicate with them - thank them for their purchase, let them know their package is on their way, send the package in a timely manner, wrap it beautifully (you can do this cheaply) and include a brief, handwritten note. Make buying a handmade product an experience for your customers. Do you have any advertising/promotion tips for sellers to be successful? Be yourself. Your brand is more than your products and your logo. You are your brand, so let your customers get to know you. Be yourself in all your Social Media interactions, whether that be on Facebook, Twitter or Instagram etc. Post snippets about your life, your interests, your passions, your projects (without over sharing!!!). Customers want to know who they are buying from in the handmade world. Use every free advertising option available to you, such as social media. Pick the one(s) that work for you and just go for it. I prefer Facebook and Instagram. Be regular and consistent with your postings. Don't make all your posts sales pitches - my most successful posts are those where I share a snippet of my family life, my work in progress or another creative project I am working on. Again, this is all about your customers getting to know who you are. There are an array of free advertising opportunities out there. Seek them out and grab every opportunity. For example, I always put my hand up to involved with 'sneak peaks' for the markets I attend. This way, people have seen my brand online before they attend the market and may well choose to seek me out and see what I have on offer. Can you share any lessons that you have learned the hard way? I think that would be to have more confidence in myself. When I first started Here We Go Loopy Lou, things seemed overwhelming. Looking at more successful businesses would often make me question if my product, and if in fact I, had what it takes. Now I know that even the most successful businesses started from scratch and, at some point in their journey, their owners probably had similar doubts, questions and insecurities that I had. However, while I still have many lessons to learn (I am sure many will be the hard way! ), I have confidence in my products, in myself and in the direction my business is heading. The future excites me! I might never become a millionaire making cards, but it makes me happy!! What do you like to do besides creating? I love to travel. As a child, I would spend hours looking at my atlas, dreaming of where I would visit one day. I'm am so grateful that I have had the opportunity to see places I once dreamed of, such as Paris, London, Italy and Egypt. With young children, practically and financially, our overseas travels are well and truly on hold. However, my three boys already have a sense of adventure and I would love to travel with them one day. For now, we love to spend our weekends and school holidays discovering new places and new things to do. It might be a trip to the snow, discovering a new bush walking track, a drive in the country or even a new park to play in. As long as I am with my little family, I am happy. I also love to read, watch movies, garden, cook, go out for dinner, catch up with my family, have a good belly laugh with my girlfriends and go on the occasional date with my husband! What is your favourite music, television show, film, book, website? Music - anything from the 80s and anything that makes me want to dance. Right now that is "moves like jagger" because my boys and I always dance like there's no tomorrow when we hear it!! Television Show - Offspring, House Husbands, Revenge, Survivor and Escape to the Country. Film - Love Actually, Notting Hill, Bridget Jones - basically romantic comedies. Book - Pride and Prejudice is my all time favourite, but I am about to read "A long way home" after seeing Saroo's amazing story on 60 Minutes recently. What would be your perfect day? I am always at my happiest when I am on a beach holiday with my little family, when we have nothing to think about except how we are going to spend the day together. So my ideal day would be waking up and going for an early morning walk along the beach (alone!! ), having a home cooked breakfast (not by me! ), spending the morning frolicking on the beach, going out for lunch and a big ice cream, spending the afternoon swimming in the pool, going out for dinner, followed by a night walk along the beach. Then doing the same thing again the next day!!! Who is your favourite madeit seller, explain why in less than 10 words?